Patel can be reached at shafaq_patel@emerson.edu. WELL, the Netherlands—The Office of Student Affairs is strongly advising students at the Kasteel Well Program to not go to Spain because of the political challenges and violence in the country. The Student Government Association approved an initiative that calls for improvements in the college’s academic departments and changes across the campus that would help the students. Emerson’s new Director of Religious and Spiritual Life and Campus Chaplain Harrison Blum discussed potential spiritual and religious events with the Student Government Association at Tuesday’s meeting. The Incident Journal for March 20 to April 2. Problems with communication and engagement are part of the reason that all the Student Government Association candidates on this year’s ballot are unopposed and most are current members. Alpha Phi Omega will host an overnight dance marathon in April with funds from a Student Government Association appeal. When people attack Trump's looks, they take away the importance of his actions to his looks, which are not nearly as significant. Emerson’s Alliance for Gays, Lesbians, and Everyone will host two weeks of LGBTQ sexual education awareness with funds from a Student Government Association appeal granted last Thursday. Asian Students for Intercultural Awareness received funding this Tuesday for its annual cultural month, which will highlight diverse stories of Asians and Asian-Americans. The theme for the month is storytellers, and the organization will invite guest speaker Kelvin Yu, a writer and producer on Bob’s Burgers. The Incident Journal for March 13 to March 19. The only students running for any position in the Student Government Association elections this year—excluding potential write-ins—are unopposed, largely current members. The Incident Journal for Feb. 27 to March 12. The Incident Journal for Feb. 20 to Feb. 25. Faculty members at Tuesday’s Faculty Assembly meeting learned that the make-up day for last month’s snow day will be moved from a Saturday in April to the last weekend in March. The show will have VDA design the set this year instead of students because the current students are not prepared enough to build it. The Incident Journal for Feb. 6 to Feb. 19. Emerson’s director of intercultural affairs introduced a plan to the Student Government Association to bring students of different cultural backgrounds together to better assess the college’s campus culture next semester. The Student Government Association considered student concerns about career services, sustainability, and resources to present to the Board of Trustees. Gabriela Kula, executive vice president, mentioned difficulties students have finding jobs after graduation. Emerson Understanding National Immigration Through Education (UNITE) wants the campus to begin taking action to protect and support undocumented students and staff, which includes declaring the college a Development, Relief, and Education for Alien Minors (DREAM) school. 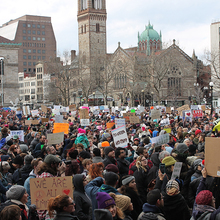 Emerson multicultural organizations rescheduled a retreat Sunday to join a protest for immigration and Muslim rights in Copley Square. Crime Log for Jan. 1 to Jan. 21. Student Government Association voted to unanimously support a new petition requesting Emerson to publicly declare itself a sanctuary campus to assist undocumented students. In their most recent meeting, the Student Government Association funded a variety of organizations to help them produce scripts, music, and virtual reality. One of Emerson’s satirical news organizations, Hyena Comedy, will print an issue of the Freakin’ Beakin for the first time since 2014, thanks to almost $250 in Student Government Association funding. “It’s showing so much about our community and how much we want to care for each other and support each other, even if it is just walking,” Clark said. Students in Emerson’s chapter of the National Broadcasting Society(NBS) will buy a new camera after the Student Government Association approved an appeal for funds last Tuesday. America has spoken, but a cloud of confusion cast its shadow at Emerson the day after Donald Trump became President-elect. A new interdepartmental minor called “Nonfiction Narratives”—which will include courses from journalism; visual and media arts; writing, literature and publishing; and performing arts departments—may be offered next fall. The Student Government Association granted an appeal Tuesday to Mercutio Troupe for its production of In the Heights and reviewed discussions with the Board of Trustees. At their meeting on Tuesday, the Student Government Association granted appeals to a number of student organizations to help them fund fashion shows and trips to both western Massachusetts and the West Coast. On Tuesday, the Student Government Association elected two new members and granted an appeal for funds that will enable Emertainment Monthly staff to attend New York Comic Con.